During a quick trip to Wal Mart yesterday, I made a little side trip through the Christmas aisles. I'm thinking of decorating the dining room chandelier for Christmas this year and I needed some inspiration. 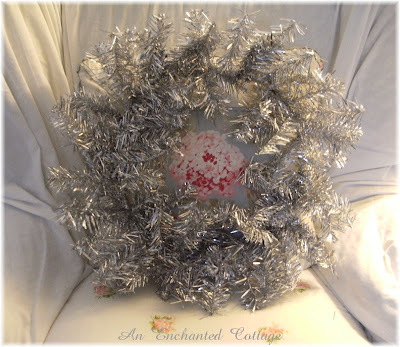 Well look at what these skimpy little wreaths blossom into when you pull and tweak all the little tinsel boughs! Woo hoo!! Score!!! (I don't think these are going to last long in the dollar section so if you're in the market for tinsel wreaths, make a dash to Target!) 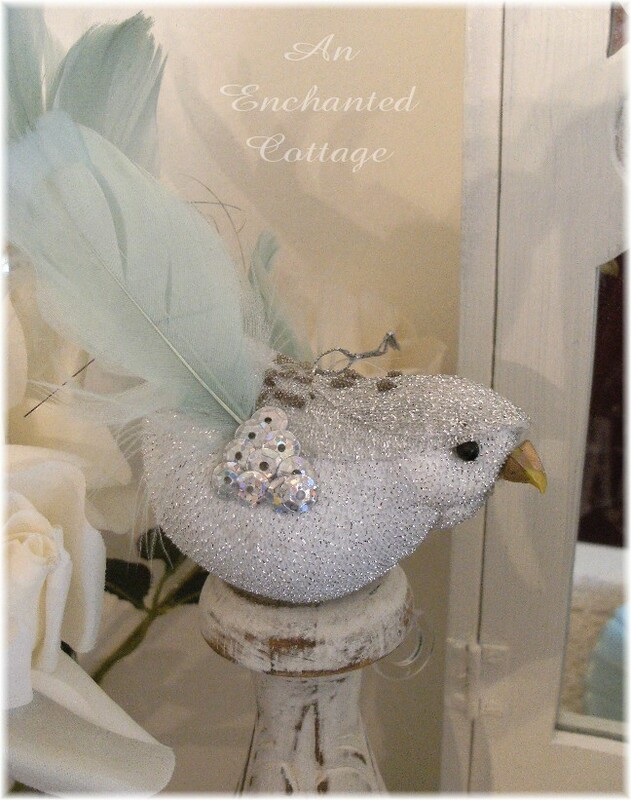 I know that some people think they're a bit gaudy and cheap looking, but oh, how they remind me of the vintage decorations of the Christmases of my childhood!! And being the nostalgic, sentimental fool that I am, I love anything from that era! Today I played around with everything to see how it would look, and we may just end up eating Thanksgiving dinner under a Christmas chandelier because I don't know if I want to take the time to disassemble it (only to reassemble it again next week!!) I'm joining Tracey's (Notes from a Cottage Industry) Virtual Holiday Home Tour on December 1st, and if any of you would like to join in and show off your Christmas decorations, just click here for details! And even if you don't want to participate, be sure to visit Tracey's blog that day because she'll have a list of blogs who've decorated for Christmas - and let me tell you (based on the past years) - it's spectacular! There's so much to see! Sometimes Tracey even spreads it out over several days! So on December 1st, make yourself a cup of tea, coffee, or cocoa, and then settle in and browse to your heart's content! Hi Donna! Oh, I love those little tinsel wreaths and birds! You did good! They do remind me of my childhood too! I'm a little on the old fashioned side myself and this just rings my bell! Wow that tinsel wreath looks fab for a $1!!!?? Loved Aussie Target wished we had one in England! Love the Chandelier..Birdie is soo pretty!!! Lovely post hun..off to look at that link! I shall remember the date! I think I'd just leave it up. No matter how hard you work to put it back (if you take it down), if you're anything like me you'll think you did best the first time around and wonder why you didn't leave it alone! I too am the nostalgic type. I'm even sort of yearning (a little bit) for the old white fake trees! I think you should leave it up and enjoy it for some extra days. It's to cute to take down. I saw those the other day when I was at Target and almost picked up one but didn't. Now you made me wish I did. I may have to go back. I think the wreaths are beautiful and the bird, so pretty. I think that it looks vintage and that is what I want, I will check my target out and see what they have. Very pretty! Puts me in the mood for the holidays! that turned out to be one great project...just lovely!!! 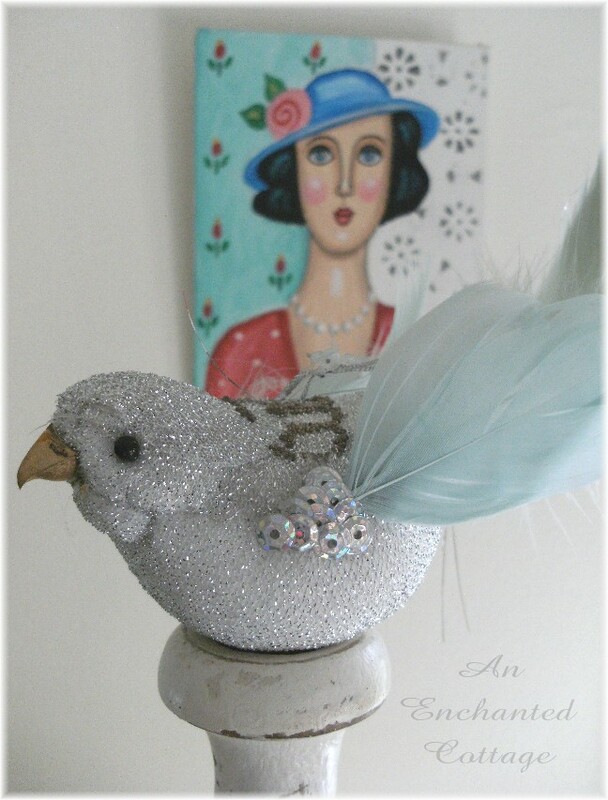 You and I are truly "birds of a feather". I bought that same little guy last week! And I just LOVE the tinsel wreath - thanks for the Target tip. I don't think they're gaudy at all - just wonderful reminders of Christmases past. It makes me wonder - when my kids are in their 40somethings what might they buy to capture the feelings of their childhoods? LOL! I went to Walmart too, but I only walked away with little brush trees. They are cute! I wanted to go to Target as well but I ended up at Home Goods. 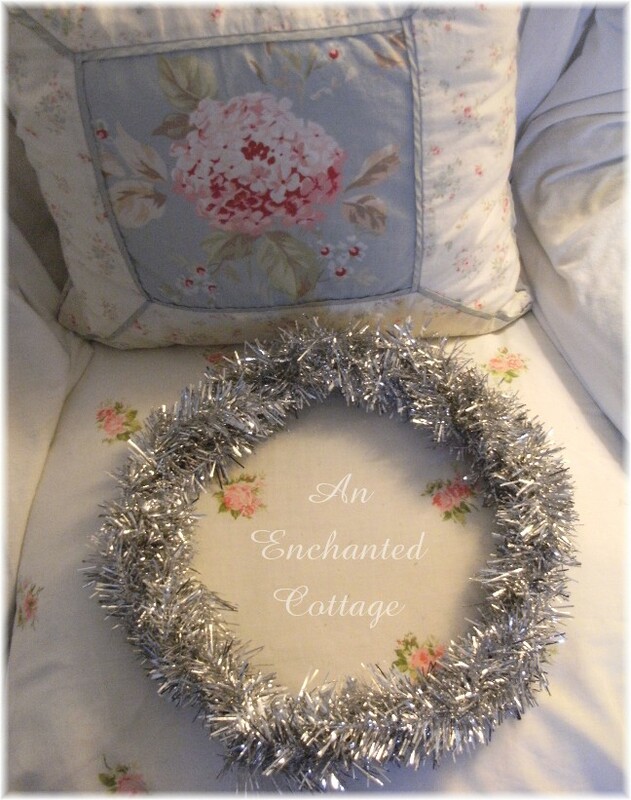 Love the tinsel wreaths. I am thinking of going with a silver and blue or silver and white theme too. 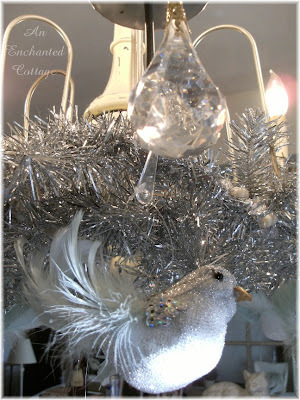 I absolutely love silver tinsel...I agree that it just reminds me of times past. I was at Target and did not see these...darn it. It is really fun to just browse the Christmas aisles at the store, isn't it! I could spend hours doing that...sshhhhh I actually have...don't tell! I want to go to Target - right now! I love what you did with the wreaths, Donna! They remind me of my childhood, too. The silver color is so festive! Oh, and those birds are beautiful. Why not leave it up...sort of a teaser for Christmas. Thanks so much for the birthday wishes! I had a great day and I will blog about it either today or tomorrow. Thanks for stopping by my blog, Donna! I can tell you're an animal lover, so we're already friends! I'll be visiting your lovely blog too. I laughed when I saw your glitter bird. I attempted something with birds too - too tempting for my 1 year old cat! Amazing what can be done in the right hands!! Leave it up, we need a little sparkle these days. Just had to let you know, went and got some of those cute little birds, thanks for the tip, maybe Target tommorrow! What great deals (steals?) you found. 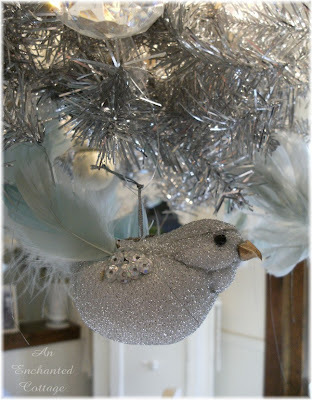 I love the bird and the tinsel and if I were you, I would leave it up for Thanksgiving too! Great deal on the wreaths. hmmm. how late is target open?? From my cottage to yours... a Christmas giveaway! More than you ever wanted to know about me!